Farrow & Ball Dayroom Yellow No.233 in a bathroom refurbishment – Kent. 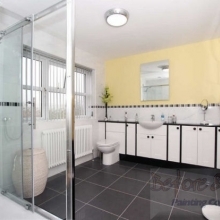 This bathroom was stripped out and fully refurbished (apart from the painting) by Home Plumbing in Sittingbourne. It is a small family run business who I have carried out decorating work for previously in their own home and for their clients. 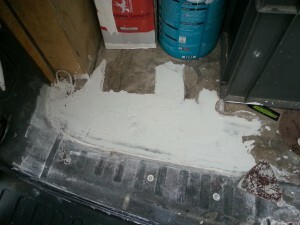 This client supplied the emulsion for the ceiling. It was Dulux pure brilliant white matt emulsion from Homebase. I don’t like retail paints on the whole, as they usually need an extra coat and this one didn’t me let me down on that score. After the industry standard mistcoat to the bare plastered ceiling and two further full coats, it still needed an extra coat. Not impressed, but hey ho! The feature wall in this bathroom was also newly plastered and needing a mistcoat. This is where the trade paints come in to their own. Even when thinning trade paints down to a mistcoat consistency, they still cover well. As usual after a mistcoat to a ceiling or wall surface, the walls are sanded using the Abranet sanding system on smaller areas (such as this project) or the Mirka Ceros on larger surfaces. Both systems boast a virtually dust free system, which my clients like and so do I. Once the wall was prepped, it was on with clients choice of paint which was Farrow & Ball Modern Emulsion No.233 – Dayroom Yellow. I personally thought it would be “a bit too much” for the bathroom and so did the husband. But on completion and when the room was finished and fully dressed it looked quite stunning as I’m sure you would agree! The work carried out by Home Plumbing from Sittingbourne and Before & After Painting was of a high standard. So much so, that the client has managed to sell their house in quick time due to the bathroom and cloakroom refurb as well. Now they have moved, they will be calling on Before & After Painting and Home Plumbing to carry out work in the new home. « Decorating a porch door and frame.